The Jug Bug is one of the Creatures in Scorched Earth expansion pack. Scutinphora puteus is a fast, flying insect that comes in two varieties, visually distinct only in the red or green markings on its exoskeleton. Biologically and behaviorally, they are practically the same. The only real difference between the two is the resource they gather in the expandable sacks on their backs. Scutinphora with green markings gather water, and Scutinphora with red markings gather oil. This unique ability makes Scutinphora a target for both the desert's natural predators and human survivors. Finding a green Scutinphora at the right time could prove to be life-saving, and survivors can use the oil produced by red Scutinphora for a wide variety of purposes. After collecting the resources from a Jug Bug, it, as well as any other Jug Bugs within proximity, will fly away. If it is attacked, it will also fly away. The container on its back will visibly shrink when resources are taken. 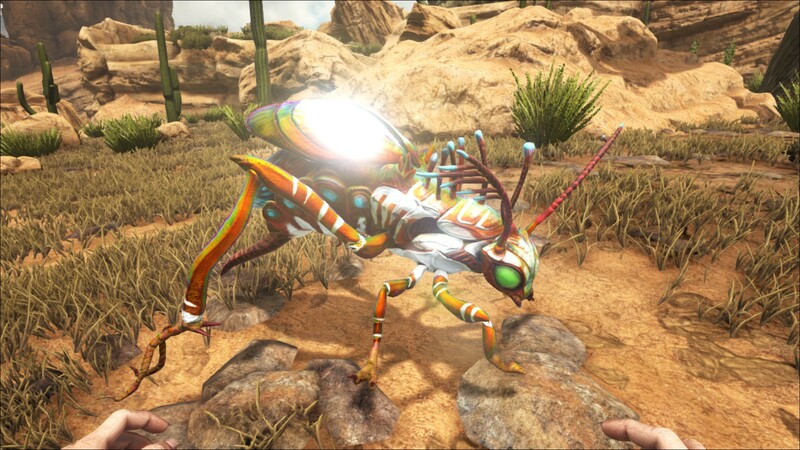 Colorful, grasshopper-like insects found throughout the Scorched Earth, members of genus Scutinphora are consummate desert survivors. The species comes in two morphs, each equipped with a fluid-storing pouch on its back: green morphs store water, while red morphs collect and store oil, perhaps to metabolize it as some sort of food. These so-called "jug bugs" are largely defenseless and will instead fly some distance away from attackers. This section displays the Jug Bug's natural colors and regions. For demonstration, the regions below are colored red over an albino Jug Bug. The colored squares shown underneath each region's description are the colors that the Jug Bug will randomly spawn with to provide an overall range of its natural color scheme. Hover your cursor over a color to display its name and ID. For example, "cheat SetTargetDinoColor 0 6" would color the Jug Bug's "body" magenta. 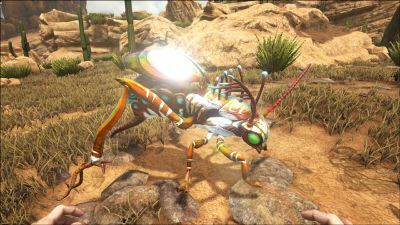 The Jug Bug poses no threat to players, tribes or even wild dinos. 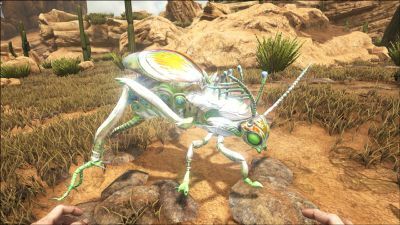 The only reason not to kill one is the "golden goose" metaphor; a jug bug is far more useful to the player alive, as it offers only an insignificant amount of meat and chitin when killed. If a survivor wants to kill a Jug Bug, it is best to leave their sack full, as when they try to flee their movement speed will be severely lowered, making them easy targets for spears and bolas. Spears and bows will do the trick. While chasing a Jug Bug, you might accidentally fall off a cliff or run into an aggressive dino. To prevent this, a well charged bola will hold it down to prevent unnecessary chasing across the desert. Completely defenseless, low health, and slow when the sack is full. Despite being un-tameable, the Jug Bug is a viable source of Water and Oil on the Scorched Earth. Players may want to trap them in cages or huts to be easily harvested for their resources if no natural Water and/or Oil is around. Use a Megalosaurus, Kaprosuchus, or grappling hook to place them in your holding area. Resources—water or oil—may be obtained without harming the bug. Cementing Paste (both). 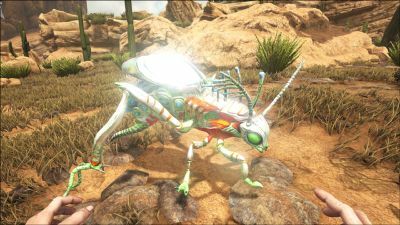 To farm it you will need a Beelzebufo (a high damage one is need to make sure the bug doesn't fly away). This creatures design may have been inspired by the honey pot ant as it has striking similarities due to them storing food within a swollen abdomen. This characteristic may lead us to believe that these insects are related to Titanomyrma. There's a bug which let's you harvest twice the amount of oil from a killed jug bug by taking the oil from its inventory first and after that using the collect oil option in the radial menu.